I have, on occasion, taken a plunge into social media to see where our beloved topic of FATCA is being discussed and/or used. There is a considerable amount of posting being done on the topic, and I think it’s important to realize that, despite the plight of U.S. persons living abroad, enforcing FATCA is actually part of the job description for those who administer the violation of our rights on a 9-to-5 basis. Often, during my seemingly endless scrolling on sites like Twitter and Instagram, I encounter posts by individuals who live overseas and work for foreign financial institutions. Some of these posts are simply group selfies – taken to commemorate the conclusion of FATCA trainings that are intended to help staff understand the ins and outs of reporting. Some posts are flat-out advertising for financial services to help those caught up in the FATCA dragnet. But I came across one post recently that really caught my attention. 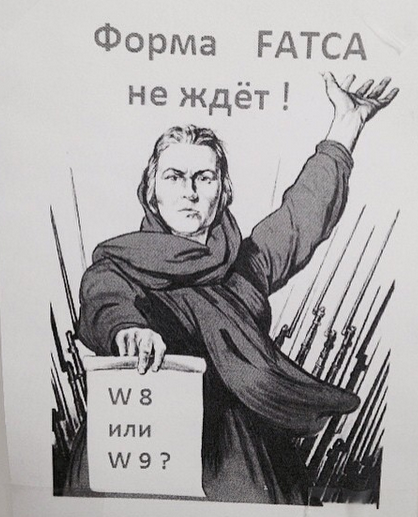 Aside from the obvious “W8” and “W9,” the poster’s text is Russian, and the image is borrowed from a famous World War II Russian propaganda poster. The original WWII poster, entitled “Motherland is calling!” was created by socialist realism artist Irakli Toidze. According to history, Toidze’s wife had burst into his studio to announce that the Soviet Union and Nazi Germany were at war. 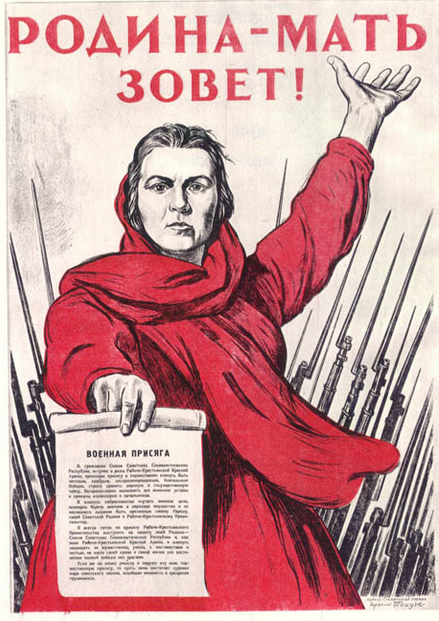 Her face and posture in that moment were used by Toidze in the poster, and the original text is the Soviet military oath used between 1939 and 1947. From what I’ve read, the poster was among Stalin’s favorites (he was personally approving every propaganda poster at the time). Stalin was so moved by the poster that he ordered 5,000 copies printed upon seeing it. Since then, the poster has been re-purposed as propaganda for many causes – including the cause of one particular Russian bank to whimsically ensure FATCA compliance. The fact that a Russian bank has a “motivational” poster hanging in an office to envourage staff to get a W8 or W9 from suspected U.S. persons is interesting, to say the least. More like painfully ironic, given the context of the original poster. Despite the overtones and irony of the original World War II poster, I think it shows a perspective of FATCA that we don’t always see – that of everyday people who are simply doing a job they aren’t in a position to question – much like the job of those whom the original poster was meant to “call,” I suppose. I told my bank that form W9 is illegal because there is no OMB number on it (proof income tax violates the US constitution). No answer…haven’t filled it out and never will. IRS can go and fly a kite on Mars as far as I’m concerned ! Wish I was as brave as Steven. I went ahead and complied with all the FATCA edicts in order to be able to renounce, which I did on Monday the 2nd. I felt sad on the way there, but afterwards felt almost nothing. This was in London, and the consular official was businesslike but sympathetic. It’s over now, but having been a US citizen for 71 years, I only regret that in order to avoid the tax slavery I had to give up part of my identity, but as they say, you can take the girl out of California but not California out of the girl. I’ll continue to support the Canadian efforts and Isaac Brock, which has been a real support through all this. Thank you SO MUCH for coming to London John Richardson. @ HELP…I am on my way out the door Dec 1. I am sorry that you had to go through this. They can’t take your identity unless you let them. It’s a piece of paper and they can never, never steal what the hearts feels. I don’t identify myself as an American as I left as a small child. My heart beats red and white. If you still feel red, white and blue, thy can’t rake it away! @HELP, if it is any consolation….America renounced you, You did not renounce America. That shinning city on the hill is no more, it is gone. I relinquished ten years ago….my leaving was very bad……. Anyways, one thing I have learned here on Brock is that internal strength which I believe was part of the American Experience and Ethos long long ago, is actually still alive amongst us former pats and ex-pats. The America that was…..left……..and it is now on other shores. I do not even know what to call what remains. Steven, what do you mean no OMB number, what does OMB mean? Sorry, I should probably know but I don’t. I didn’t know either. Search Engine says that OMB stands for Office of Management and Budget. Apparently paperwork forms in the U.S. have to produce and verify their “Papier Bitte” and show their assigned number. And just like their human victims the forms can expire too. found out what OMG means. Then that must be the busiest department in the US government, LOL! Too bad they don’t produce anything useful for ordinary humans. I am very glad to be free of all that insanity. COMPOST…FORMS CAN BE COMPOSTED AND THAT’S EXACTLY WHERE THEY BELONG! It would be interesting what Vladimir Posner (Russian TV presenter born in France, but grew up in NY and has US citizenship supposedly). He speaks English with an American accent and would be known to US viewers during the Cold War. At 81 years of age and living in Russia whose Government would be unlikely to enforce any tax claim against him, however, his opinion of FATCA would be interesting. FATCA makes edict of the month on Russian bankers walls. In Soviet Russia, you’re the plaintiff suing the defendant who accused you of violating the law. Oops wait, Russia’s not involved in that. This is a very telling post. A Russian bank using a Stalinist era propaganda poster to explain FATCA. FATCA is about as totalitarian as it gets. The US government has surpassed the Soviets in the financial control of its citizens. Stalin rolls in his grave with envy. OMG would really love a copy of that FATCA poster. Anyone know how to obtain one?